Cubic Transportation Systems was awarded a contract for more than $8 million to convert existing paper magnetic farecard vending machines to sales and reload devices for SmarTrip, the contactless smart card for the Washington Metropolitan Area Transit Authority (Metro). The project is part of the agency’s plan to eliminate paper ticketing from its fare system to all contactless media by spring 2016. Cubic will upgrade more than 500 machines with hardware kits including smart card readers and related software on all Metrorail lines, including the Silver Line to Dulles Airport that opened Saturday. Cubic also produced and installed the fare collection system to the new line under a separate contract. 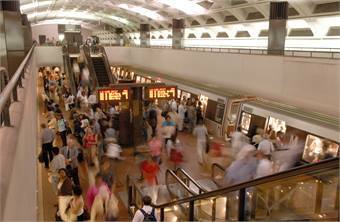 Cubic has been involved with Metro’s fare collection since the system opened. The company delivered the original magnetics-based system in use since the early 1970s and designed and delivered the SmarTrip system that opened to the public in 1999.